If you know me at all, you know I love puns. So, calling your beer “Hoptical Illusion” is an easy way to get me to think you’re pretty cool before I even taste your product. First impressions and all. This particular beer comes from Flying Monkeys Brewery in Barrie, Ontario. I’m not sure yet what the illusion is being referred to here: is it that anything good could come out of Barrie? Is it that this particular beer is good at all? Is it that we only think monkeys can fly when we’ve had too much beer? Whatever the case, at least they didn’t call it ‘The Oldest Trick in the Bock.’ I don’t like to be fooled in matters of beer. We’re talking about illusions, Michael. A trick is something a whore does for money. Or beer! Enough talk. Let’s find out what truth awaits inside the can. The Can: This colourful can is awash in imagery recalling 1960s psychedelia. It features images of Canadiana and a bunch of seemingly nonsense slogans like “Love me, Love My Truck.” There’s a lot going on, which should mean there’s something to please everyone—there is a Tragically Hip reference, after all. You might enjoy unpacking all the design elements, but I could barely look at this can for longer than a couple seconds. The idea is kind of fun and cute, but the execution is an ugly mess. 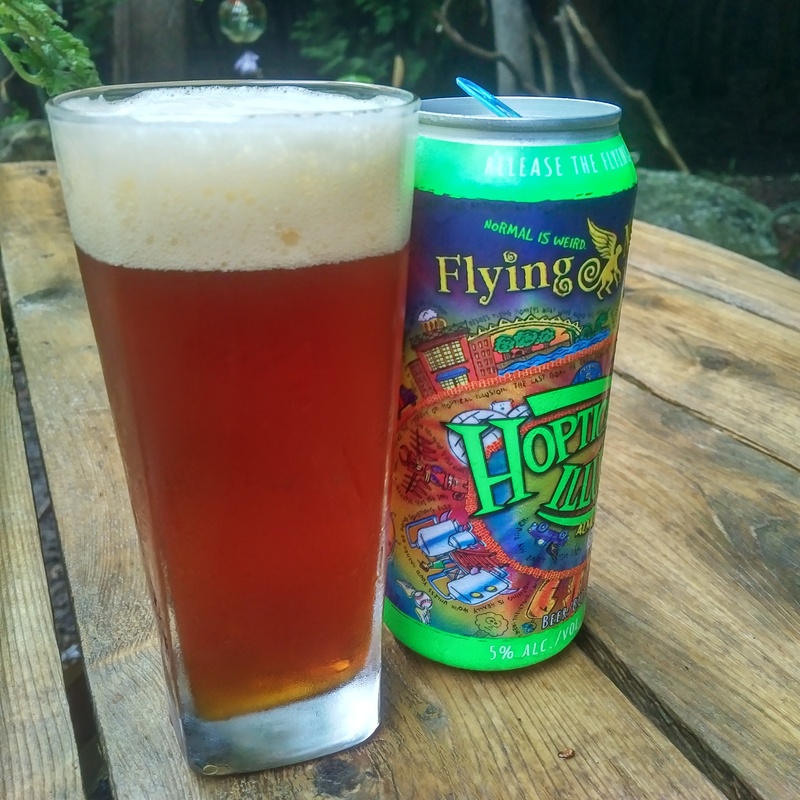 Flying Monkeys is marketing a beer like a Grateful Dead record. I thought all rational people agreed that neon green is never a good colour to use in design. This seems to be a brand-wide problem. Their website is nigh unnavigable and commits the cardinal sin of web-design: auto-playing music. Guys, don’t try so hard. The Colour: It’s a rich, satisfying copper colour, bright and bold. Maybe the illusion is the way it looks gold-toned at the bottom of the glass when the light hits it. The Flavour: The Hoptical Illusion hits you first with heavy hops balanced by sweet, caramelly malts. There’s a bold, strong citrus taste that comes out first. It’s really lovely, balancing the hops and making for a nice, rounded brew. The fruity notes linger in the aftertaste more than the bitter, which I like. Contrary to the company motto that “normal is weird,” this beer is on board the hops train, destination: Trendville. It’s not a particularly striking, original flavour, but it is a good one. 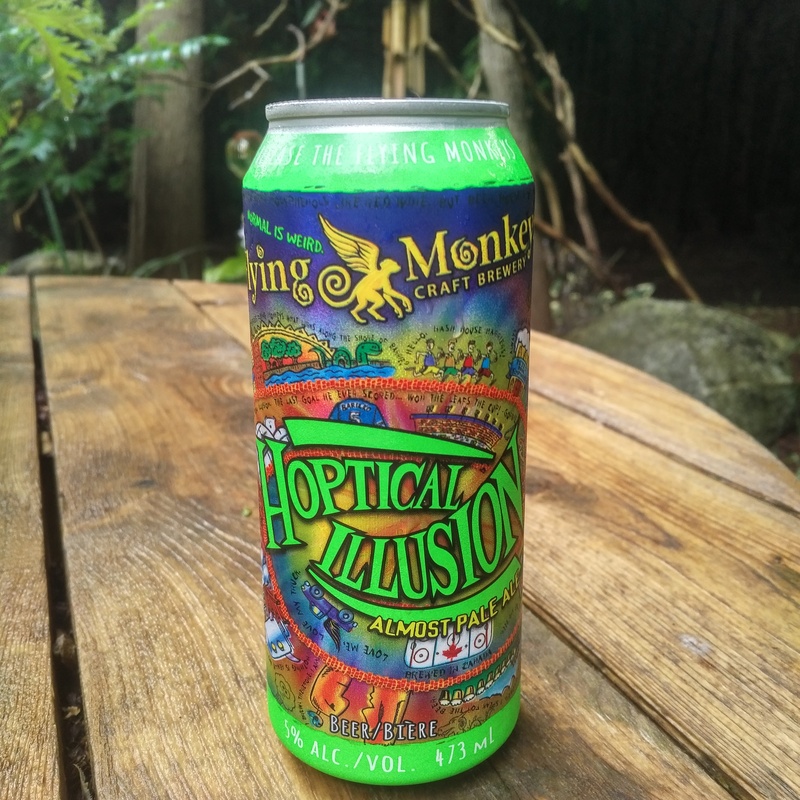 The Verdict: Flying Monkeys has tried to distract me with all this sleight of can’d nonsense, but I think I’ve finally figured out that the illusion is just that they made a good beer dressed up as a special one. Does “normal is weird” function as a invitation, an ideological umbrella under which everyone and everything is weird and therefore no one and nothing is? Or, as is more likely, is it a screed against banality and sameness? If it’s the latter, it’s disingenuous. This beer is normal. And maybe normal isn’t so bad. To be fair, this was one of the first beers with a higher hoptitude that went ‘mainstream’. Remember when Tankhouse was considered hoppy? I think it seems ordinary now because too many other beers have moved to trendy Hopville (and we’ve already seen a mass exodus from there to Sour City), but it was one of the first residents. It’s the old man on the porch complaining that the neighbourhood has changed. I still like it, though, and I can’t really say the same about Tankhouse, its next door neighbour who never talks to anyone.